The post Dog Growling — 4 Things to Know by Sara Reusche appeared first on Dogster. Copying over entire articles infringes on copyright laws. You may not be aware of it, but all of these articles were assigned, contracted and paid for, so they aren’t considered public domain. However, we appreciate that you like the article and would love it if you continued sharing just the first paragraph of an article, then linking out to the rest of the piece on Dogster.com. The little dog had been in our training center for 15 minutes before he noticed the giant painting of a dog hanging on the wall. His eyes widened as he took a step toward it, growling. “Pssht!” his owner hissed, snapping her fingers at him. He jerked in surprise, then sat down and licked his lips. The dog growling didn’t happen again, but he continued to stare at the painting, trembling slightly, paw raised. First, why does dog growling happen? Why does dog growling happen? Photography ©Volodymyr_Plysiuk | Thinkstock. Dog growling happens for a variety of reasons. Fear, insecurity, guarding behavior, offensive aggression and play can all elicit dog growling, although to an expert these growls are each unique in their tone and pitch. Outside of play, dog growling serves as a warning that all is not well in the dog’s world. Something is off, and our dog is doing us the courtesy of sharing that information. “Why did you just snap at your dog?” I asked the little dog’s owner. “I want him to know that I won’t tolerate that behavior,” she replied. It’s human nature to respond negatively to a dog’s growl. 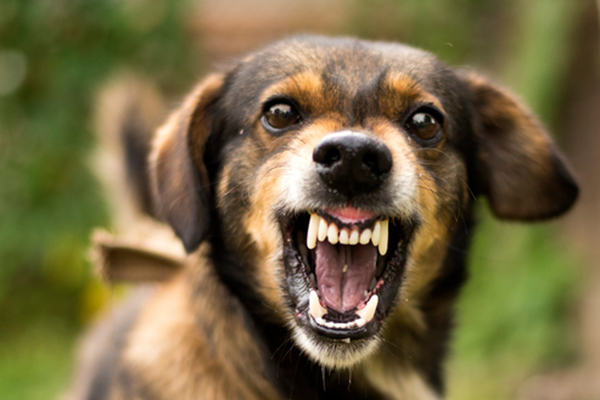 Dog growling is an undesirable behavior and can oftentimes be a precursor to a bite. However, as I explained to the little dog’s owner, it’s important to suppress your urge to correct your dog for growling. Thank your dog for growling, and remove or redirect him from the situation that’s provoking the dog growling. It’s better than the alternative. Dog growling tells you that your dog is unhappy or uncomfortable. Something is wrong. Think of it as an early warning system. If your dog doesn’t warn before he bites, it’s either because you’re missing his precursor signals or because he no longer feels safe displaying them. Either way, the fault here lies at the other end of the leash. Dogs who go straight to biting without displaying lots and lots of precursors are much more difficult to treat. I would much rather work with a dog who stiffens up, displays whale eyes, hard-stares me, curls his lip, growls, freezes and then (finally) bites, than a dog who goes straight from a freeze to a bite. It will be much easier to keep the situation safe with the first dog. The latter case is much riskier. The little dog was understandably worried by what he perceived was a giant dog, frozen and staring at him (both confrontational and potentially aggressive behaviors) from across the room. His owner would have done better to acknowledge his fear, using treats to reward him for looking at, and later on investigating, the frightening painting (and she will in the future, as she now has the tools to better deal with situations that make her dog uncomfortable). In this situation, the dog growling was merely a symptom of his insecurity. Treating the underlying cause will make the symptom disappear far more effectively than suppressing it. Tell us: What situations cause your dog to growl? How have you addressed dog growling? Please share your stories in the comments! Sara Reusche is the owner of Paws Abilities Dog Training in Rochester, MN. She has more than a decade of training experience. Sara became a Certified Professional Dog Trainer in 2005 and a Certified Veterinary Technician in 2006. She has also worked as a dog groomer, vet tech, doggy daycare attendant, and animal shelter caretaker and trainer. She spends most of her time working with serious behavior cases and has a special fondness for reactive and anxious dogs. This post previously ran on her dog behavior blog, Paws Abilities, and is rerunning here with her permission.